I love those misfit shows cancelled during their first season, before they ever really get going. It means one of two things: either the show is unrelentingly terrible, or it's insanely brilliant ("Freaks & Geeks," "The Tick," "Wonderfalls," "Greg the Bunny," "Karen Sisco," etc.). 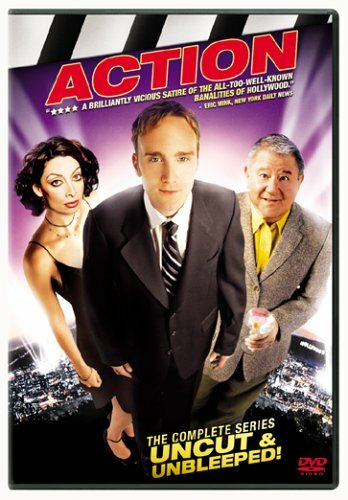 Strangely, "Action," whose thirteen episodes have been released in a new DVD from Sony Pictures Home Entertainment, is one of the few that merely falls in the middle. Jay Mohr plays a sleazy, razor-tongued Hollywood producer who has just come off his first major failure. At his side are a clever prostitute (Illeana Douglas) and his driver (Buddy Hacket). They try to weather the storm with spin and bull and also with a hot new script that they hope will turn into a hit. "Action" is cynical and sporadically hilarious but Mohr can't quite convey that measure of humanity that would make him endearing -- and worth following every week. Even idiots like The Tick and Homer Simpson or total bastards like Al Bundy or Greg the Bunny have some kind of appeal. Not to mention that the evil Hollywood producer is already a tired clich�, both onscreen and offscreen. During its brief run, "Action" managed to snag star cameos by Keanu Reeves, Sandra Bullock and Salma Hayek. The late Ted Demme directed the pilot.